Although their roots have been attributed to different cultures, Amish quilts are regarded by many as “quintessentially American.” In Amish Quilts: Crafting an American Icon, Janneken Smucker investigates this claim and talks specifically about the Hmong, many of whom immigrated to Pennsylvania and changed the Amish quilt trade some thirty years ago. In the 1970s many Hmong fled to the United States after the Southeast Asian War. They left their refugee camps in Thailand and resettled into their new homes with the help of the Mennonite Church. Hmong communities began to grow in California, Minnesota, Washington, Rhode Island, Michigan, and Pennsylvania. As a source of income, many Hmong women decided to sew and sell their native textiles. Paj ntaub—translated as “Flower Cloth”—is a popular Hmong textile that requires expert skill for its intricate designs, which are symbolic in the Hmong culture and resemble natural forms. The creation of these textiles uses many similar techniques to quilt-making. For example, three textile practices used in the making of paj ntaub are embroidery, batik, and appliqué, which is the practice of applying smaller pieces of fabric to a larger piece to create patterns. While Hmong immigrants all over the country earned income from producing paj ntaub, those in Southeastern Pennsylvania soon realized that there was a more sizeable market for Amish quilts, especially prevalent in Lancaster County. 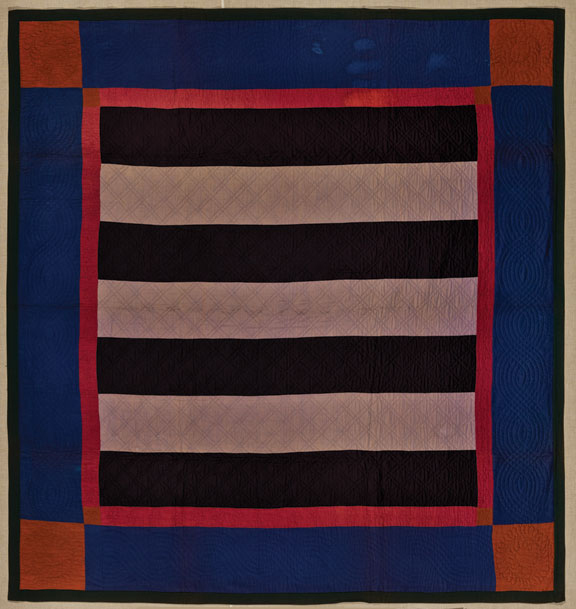 In the nineteenth century, many Amish quilts—including some currently on view at NMWA in “Workt by Hand”, such as Bars Quilt, 1890—remained monochromatic geometric forms pieced together in creative ways. By the twentieth century, Smucker mentions that Amish women expanded their quilt pattern repertoire to cater to their market. In the 1980s, “The Country Bride”—a relatively difficult appliqué pattern—began growing in popularity, and the Amish found great skill in Hmong women due to their expertise in appliqué. Similarly, Smucker states that Hmong quilt seamstresses could create ten quilts in one day that could be sold for $25 each, while a paj ntaub for the same price could take up to a week to create. For these reasons, many Hmong women in Pennsylvania ceased making paj ntaub and instead adapted their skills to work as seamstresses of Amish quilts. From there, Smucker illustrates that a great deal of outsourcing began to occur. Amish women would outsource the work to Hmong seamstresses in the United States, and these Hmong seamstresses would then outsource the work to impoverished families in Thai refugee camps who were not aware of where the quilts were from or where they will ultimately end up. Like “Workt by Hand”, which aims to debunk quilting myths, Janneken Smucker’s book demystifies the “quintessentially American” nature of Amish quilts. —Kyla Crisostomo is the publications and marketing/communications intern at the National Museum of Women in the Arts. Also, click here for information about NMWA’s April 24 talk and book signing by author and quilt historian Janneken Smucker.